Not all the noise emanating from the NHRA’s Pro Stock Motorcycle pits in 2011 was engine-related. En route to his second world championship, Eddie Krawiec bowed-up and figured out how to turn the smack talk regularly served by Hector Arana Jr. and Jerry Savoie, among others, to his advantage. “That motivates me,” said Krawiec, a no-nonsense guy from Bayonne, N.J. “That’s actually motivation. Whenever people talk junk, I’m pretty consistent – I don’t let anything get in my head. I stay with my routine. I try not to let anything out of the ordinary throw me off. I can handle myself in different situations. Krawiec followed that elementary blueprint to three poles, four victories in six final-round appearances and a 90-point margin over Arana Jr. in the Full Throttle Drag Racing Series standings. The 2012 season for two-wheelers is scheduled to get under way today with the opening rounds of qualifications for the 43rd annual Tire Kingdom NHRA Gatornationals presented by NAPAFilters.com at Auto-Plus Raceway at Gainesville, Fla.
ESPN2 and ESPN2HD will televise one hour of qualifying coverage at 4 a.m. (ET) on Sunday, with a re-air of the qualifying show at 5 p.m. (ET). ESPN2 and ESPN2HD will televise three hours of eliminations coverage beginning at 6 p.m. (ET), also on Sunday. 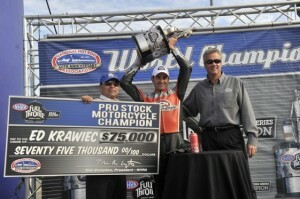 Eddie Krawiec won a big Wally and the big check last year. reigning world champion Jason Line in Pro Stock. Del Worsham, who won the event in Top Fuel last year, retired after clinching his first world championship in November. 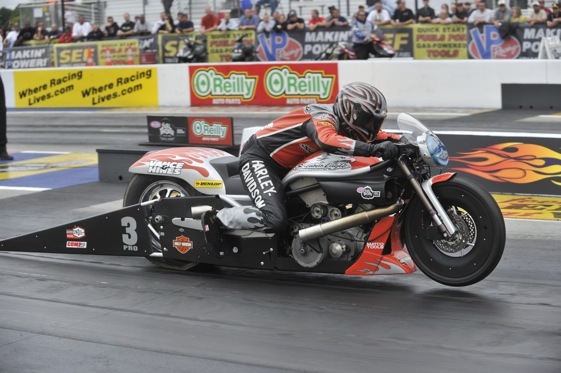 Krawiec, who captured his first PSM championship in 2008 without winning a national event, has a shot at NHRA history out of the box this weekend. While three other competitors have won the season-opening race back-to-back, no rider has ever won three in a row. “That would just be an awesome thing,” said Krawiec, who will carry the No. 1 plate on his Screamin’ Eagle Vance & Hines Harley-Davidson V-Rod tuned by Matt Hines.”It’s not many opportunities you get to go back-to-back, but to try to do it three times in a row is definitely something that I’d love to do. Right now I’m not even thinking ‘championship,’ I’m thinking more ‘Gainesville.’ It would be great to start off the year with a win. Krawiec opened the 2011 season in style at Gainesville by posting a class quarter-mile speed record of 199.26 mph – barely missing the historic 200 mph barrier. After defeating Karen Stoffer in the final, Krawiec never was ranked lower than third on the points table for the remainder of the season. Krawiec posted a 35-12 won/loss record (.745 percentage) while qualifying in the top half for all 16 national events. His championship was the fifth in eight years for the famed Vance & Hines H-D team co-owned by Terry Vance and Byron Hines. Arana Jr., meanwhile, went 24-11 (.686 percentage) during his rookie season, which got off with a thud when he failed to qualify at Gainesville. Despite that stumble, Arana Jr. rode his Lucas Oil Buell to three wins and five final-round appearances, including a victory at the prestigious Mac Tools U.S. Nationals near Indianapolis. Eddie Krawiec is immune to big talk. Automobile Club of Southern California Road to the Future Award, which recognizes the top-performing rookie of the year. Hector Jr. enters the 2012 season upbeat and unplugged. Arana Jr. also indicated he is not about to tone down the rhetoric he directed, primarly at Krawiec, during the six-race Countdown to the Championship. “Oh, no, I love to have fun,” said Arana Jr., 22, who again will be teamed with his father. “Every time I go down the track is a plus. That’s why I’m so excited and so outspoken is ’cause I am enjoying every bit of it. I’m loving every bit of racing. I’m living my dream. I want everybody to understand how exciting this is for me. That way I can get the fans excited and riled up. They want to come watch the races more, watch it on TV. I just love it. I love just expressing all the moments. Despite their budding rivalry, Krawiec acknowledged that both he and Arana Jr. share similar backgrounds. Krawiec admittedly struggled in the middle of the 2011 season, with five of his 12 losses the result of an opponent’s holeshot. Two of the losses came via red-light. 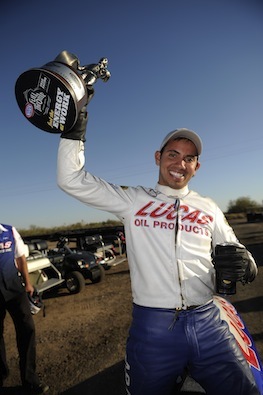 Biker Hector Arana Jr. was the top rookie in 2011.
willing to take a risk a little more against you,” said Krawiec, who has 11 career wins in 25 final-round appearances. “As we all know, the competition has gotten greater and greater and greater. The only way that you can have that opportunity to defend your championship is you’ve got to improve and get better as well as everybody else. That’s my goal here. My goal is to be a better racer on Sundays. “I got over my slump. We made some tune-up changes in the motorcycle that helped it react better to the way that I’m on it. The end result is hopefully it leads to good reaction times and consistent ones at that. That’s the key, is being consistent. A race-day racer needs to be 20s and 30s (with reaction time), just be good on the tune-up. Hopefully, that will get you a couple race wins. In addition to teammate “Drew” and the Aranas, Krawiec said the list of contenders includes former world champions LE Tonglet (2010) and Matt Smith (2007) as well as GEICO Suzuki’s Stoffer and Savoie. The latter will start the season on a White Alligator Racing Buell V-Twin, while keeping his Suzuki as a backup. A third championship would elevate Krawiec into the exclusive company of Matt and Andrew Hines, Angelle Sampey and the late John Myers. The late Dave Schultz was a five-time PSM world champion. Most Gatornationals victores: Warren Johnson, 9, PS; John Force, 7, FC; Don Prudhomme, 5, FC; Joe Amato, 4, TF; Kenny Bernstein, 4, FC/TF; Larry Dixon, 4, TF; Don Garlits, 4, TF; Jason Line, 4, PS; Ed McCulloch, 4, FC; Tony Schumacher, 4, TF; Dave Schultz, 4, PSM; Terry Vance, 4, PSM. Track records: Top Fuel: 3.797-seconds by Tony Schumacher, March ’10; 325.45 mph by Schumacher, March ’11. Funny Car: 4.030-seconds by Matt Hagan, March ’11; 316.15 mph by Matt Hagan, March ’10. Pro Stock: 6.495-seconds by Rodger Brogdon, March ’11; 213.57 mph by Erica Enders, March ’11. PS Motorcycle: 6.777-seconds by Hector Arana, March ’11; 199.26 mph by Eddie Krawiec, March ’11. National records: Top Fuel: 3.735-seconds by Del Worsham, Oct. ’11, Reading, Pa.; 328.62 mph by Spencer Massey, Feb. ’12, Pomona, Calif. Funny Car: 3.995-seconds by Matt Hagan, Sept. ’11, Charlotte, N.C.; 318.99 mph by Jack Beckman, Sept. ’11, Charlotte, N.C. Pro Stock: 6.477-seconds by Jason Line, Oct. ’11, Reading, Pa.; 213.57 mph by Erica Enders, March ’11, Gainesville, Fla.
PS Motorcycle: 6.777-seconds by Hector Arana, March ’11, Gainesville, Fla.; 199.26 mph by Eddie Krawiec, March ’11, Gainesville, Fla.
Top Fuel: 1. Antron Brown, 212; 2. Tony Schumacher, 180; 3. Spencer Massey, 176; 4. Morgan Lucas, 143; 5. Shawn Langdon, 139; 6. Clay Millican, 126; 7. (tie) Steve Torrence, 89; Bob Vandergriff, 89; 9. (tie) Brandon Bernstein, 85; Doug Kalitta, 85. Funny Car: 1. Mike Neff, 196; 2. Robert Hight, 154; 3. John Force, 150; 4. Jack Beckman, 137; 5. Ron Capps, 125; 6. Courtney Force, 124; 7. Todd Lesenko, 102; 8. Johnny Gray, 99; 9. Jeff Arend, 84; 10. Gary Densham, 83. Pro Stock: 1. Greg Anderson, 209; 2. Jason Line, 208; 3. Mike Edwards, 147; 4. Rodger Brogdon, 125; 5. Jeg Coughlin Jr., 122; 6. 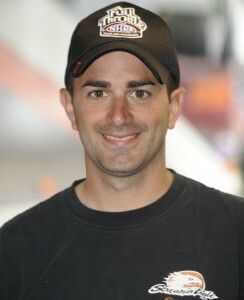 Vincent Nobile, 111; 7. Greg Stanfield, 103; 8. Allen Johnson, 93; 9. (tie) Erica Enders, 84; Shane Gray, 84. Larry Morgan, 84.